1. Will it be in the way back there? 2. Should I go vertical or horizontal ( prefer )? 3. Do I need an extra davit for keeping it stable in the wind? 4. Can the swim platform support the davit? If you don't go too heavy with the dingy and motor the swimstep should hold the weight if it was a well-built swimstep to begin with. We have a 9' Livingston with a 4hp 4-stroke Yamaha on Weaver Snap Davits on our swimstep. The motor is on a swivel mount bolted to the Livingston's transom so it can be carried vertically when the dinghy is also in its vertical stowed position. We use the boom fall to deploy and retrieve the dinghy. The slickest system for this arrangement is a Seawise davit that not only cranks the dinghy up onto its side but also automatically positions the dinghy motor in a vertical position. Very spendy, however. Carrying the dingy horzontally is another good way to go and offers a few advantages over the swim-step Weaver-type davits. In rough water the dinghy is quite aways above the waves and is very unlikely to scoop in water which can happen with a vertically-carried dinghy on a swimstep, particularly if it's an inflatable/RIB because the water will get trapped inside the dingy--- lots of weight applied suddenly to the swim-step and its hardware. The horizontal position means you can launch your dinghy in a big hurry in case of an emergency. You can with a vertially-carried dinghy in Weaver Davits too, but the horizontal systems are proabably faster. But then you have this big thing hanging off the rear of your boat. Whether that's a problem depends on where you take your boat, what your home slip is like, etc. Unless you have a very wide swimstep, a dinghy carried either horizontally or vertically will most likely render the swim step useless when the dinghy is in its stowed position. If you typically use the swim step as an aid to get to the dock while docking, you may lose this ability with a dinghy back there. Also, if you rely on a folding or retractable ladder as part of your MOB recovery plan, there's a good chance a transom or swimstep mounted dinghy will render the ladder unusable when the dinghy is in its stowed position. 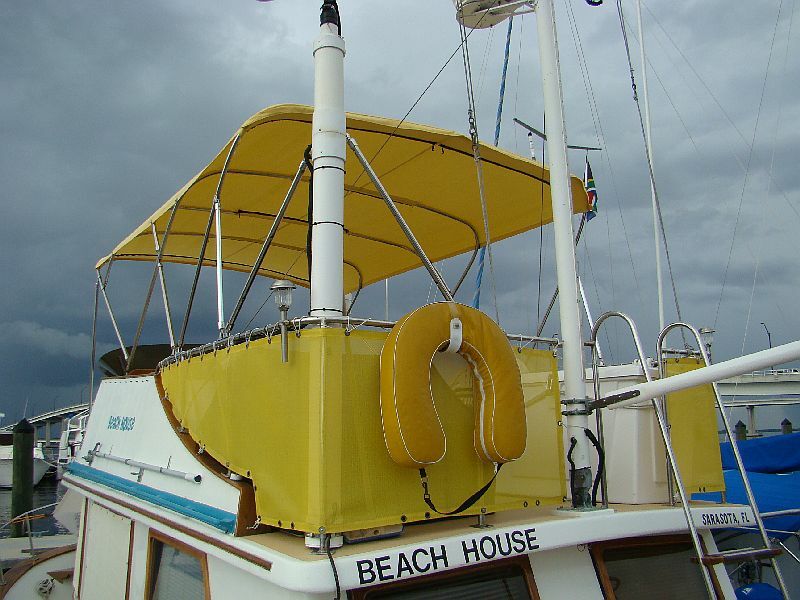 We won't carry a dinghy on a cabin top, either aft cabin, sundeck, or boat deck, for a variety of reasons. (We do carry a lovely little Montgomery sailing dinghy on the aft cabin top but that is not the boat we rely on for our everyday shoreboat use.) And our boat has pretty low freeboard aft so we don't need the swimstep during docking. So our vertical dinghy stowage with Weaver Davits on the swimstep has worked out for us very well. But when we start taking longer cruises we plan on getting a 10' Bullfrog and 15 hp motor, far too much weight for our 37 year old swimstep. So when that day comes, we'll tow the Bullfrog. My setup is like Marin's with a snap davit system. Simple, inexpensive and it works, but does make the swim platform unusable when the dink is stowed. This is something to think about if the swim platform is your main access to the boat, either when in the water or from a floating dock. Additional concerns for me is when I dock its difficult to reach the stbd aft cleat to tie off due to the two support bars that hold the dink in a vertical position. I've given some thought to repositioning these support bars, but I think the geometry necessary to make it easier to access the stbd cleat would make the whole setup unstable. Here are some shots of how we mounted our 9' Livingston. * For years we lowered and raised it with brute force--- two of us on a stout line fastened to the outboard (top ) gunwale of the dinghy. * Then one day the lightbulb went off and I realized that if we replaced the existing boom fall on the boom with a 100' fall, we could use the fall to deploy and retrieve the dinghy wihout having to move the boom at all. * So what had been a two-person, 1,2,3-Heave job became an easy job that only takes one hand. * Sort of a poor man's Seawise Davit. Note that we mounted the dinghy with a considerable lean into the boat. * This is to make the dinghy push against the* standoff mounts rather than pull on them, and it also means that any spray or water that splashes up inside the dinghy immediately runs back out. Something we learned--- if one carries a Livingston this way rain water will collect inside the trough along the bottom edge of the dinghy that is formed by the rolled-over edge of the gunwale. * Drilling a small hole in at each end of this trough (so it's in the rolled over part of the gunwale) lets this water drain out very nicely and no green gunk and slime will form in the trough. We carry a 9 foot Zodiak on Weaver davits on the swimstep. By careful length and placement of the standoffs we were able to keep a way clear on the swimstep to step onto a dock from the starboard side of the swimstep. The huge advantage of using the Weaver davit system is that when the tender is in the water but still attached to the boat, the tender remains stable enough to step from the swimstep into the dink even in fairly rough water. No tender beating against your transom in this set up. After everyone's aboard simply unweight the davit side of your tender and unsnap the davits and off you go. As to the verticle tender trapping a big wave, we don't veiw this as a threat anymore. I was very concerned about it at first but we have been in some real bad water and have had no problem with the Zodiak trapping water. It may be just the particular motion of our boat but I never want to find myself in water that would swamp the Zodiak on its davits. If I do, I'll have bigger problems than water in the Zodiak. Great convo and opinions. I do however like the idea of horizontal over vertical storage but either method is better than where I keep the Tender now. Horizontal storage does eliminate the swivel mechanism for the outboard necessary in a vertical installation. However the davit system necessary for such a system will be more costly to purchase and install. In a vertical installation you'll have to tattoo your boat name on the dinghy bottom. Clean and neat installation. Works great for me. *I like your smoke stack. Does it work or just for looks? You can probably find much on this subject by doing a search in the archives. * Within the last year we were faced with somewhat the same problem----larger, heavier dinghy and how to store it. We have a starboard side transom door that needed to be kept clear for access to floating docks (floats as they are called in the PNW). * We used the Weaver system with the lever for the 15hp 2 stroke engine. * We are happy with the rusult, and hae cruised with it at 27 knots. Pictures follow. * One picture shows the transom gate. * The dinghy is stored but not visible there. * We also did not want the weight to bear on the tubes so used a transom arc and bow locker arc. * Carries very well. * To lift it in place, I installed a mount for a removable come along under the helm deck roof overhang. timjet - "I like your smoke stack. Does it work or just for looks?" *Very nice. The owner of the yard I had some work done last year has a 40+ something '07 or '08 I believe, *American Tug, fire engine red hull. My stack is phoney too. * Lower portion is for full headroom above stairs between saloon and pilothouse. * Top portion is for the propane tank. Going back to the original dilemma of how to carry a dink on the duckboard and yet not obstruct the transom door or make using a ladder impossible, I post the pic below of how we managed it on Lotus. * The pic is not a real close-up, but I think one can make out the gist of it. * Lotus is second from the right, next to the old woody, with red canvas. The dinghy is a 9 ft Tinker Tramp, but mounted well to the port end of the duckboart, there is space for us to still use the transom door, and also swing down a ladder opposite the door, and clearing the dinghy at the same time. * Our boat's beam is not huge, just 3.5 metres (about 12 feet), so it should be possible on anything over 30 ft.
Definately not an option if one is a fisherman Peter. Makes trolling flat lines for Spaniards, Wahoo , Billies etc a bit difficult. *In a vertical installation you'll have to tattoo your boat name on the dinghy bottom.